Signs of digestive system disease in horses can include any of the following. *It is important to note that horses cannot vomit or regurgitate…. This is difficult to determine in the horse as the abdomen has a natural looking distention, housing the enormous large intestine. However, bloating is rarely harmless in horses and tends to be a symptom of a larger health problem. If you do notice that your horse is bloated, you need to call your veterinarian immediately, to rule out any serious underlying cause that may require immediate veterinary diagnosis. A bloated horse appears fuller around the stomach area. Causes of Distention: Bloat is typically caused when a horse eats or drinks too much, filling the stomach with more than can pass comfortably through the digestive system. Your horse may also bloat when he’s suffering from a blocked or twisted intestine that will not allow food to pass through his digestive system. Once any emergency situation has been ruled out, or attended to, EquiHealth stimulation can pinpoint the location of the blockage, whether that has been due to gas or obstruction, and rebalance and re-energise the blood flow and energy flow to promote swift healing, and continued regular application, along with dietary measures, may help to prevent further occurrences. Certain natural events, such as pregnancy, lactation, breeding, high performance levels, and other events, may lead to natural weight loss for your horse. This should, however, only ever be temporary and down to the individual circumstance. Once out of that circumstance, your horse will normally revert back to a ‘usual’ and consistent normal weight range. If weight loss continues, or remains, there may be further underlying causes that need attention and treatment. There may be one of many potential causes for anorexia in horses. These could relate to both primary and secondary disease states; parasites; teeth, mouth, or gum problems; nutritional deficiencies; metabolic disturbances; malabsorption problems; pain; infection; and aging processes; as well as insufficient or poor feed. EquiHealth application may help to calm your horse, destressing and helping to improve immunity to fight off disease or disturbance. EquiHealth will stimulate relevant points in relation to the cause to bring about improvement and contribute to a solution. Horses tend to eat steadily throughout the day. It is important to get to know your horse’s habits, so that any changes can be noted quickly. Sudden or unexplained reduction in feeding, or unusual and continuing excessive eating may be signs of problems. Horses may eat excessively, out of boredom when housed indoors, for example. Changes in your horse’s lifestyle, such as increased or reduced work, movement on and off pasture, pregnancy, lactation, and aging, will require changes to your horse’s diet. Rapid changes in diet can result in illness. Any changes to your horse’s diet must be introduced gradually, over a period of around two weeks. If your horse’s feeding habits change, consult your vet for a diagnosis. Following diagnosis, EquiHealth can be used as part of a treatment regime to eliminate the causative symptoms and relax your horse. Colic in horses is a clinical symptom rather than a conditional diagnosis. It is pain in the abdomen. It can originate in a variety of sites although it is often the small or large intestine (bowel). Extreme pain shows as restless, uncontrolled movements, and sweating. There are many potential causes of Colic. The condition should be diagnosed immediately and not be allowed to continue, as colic in a horse may be fatal. EquiHealth can contribute to resolving these symptoms, and indeed the cause of the condition, along with good diet, lifestyle, and professional healthcheck diagnosis. Continued regular use may help to prevent reoccurence of the symptoms. 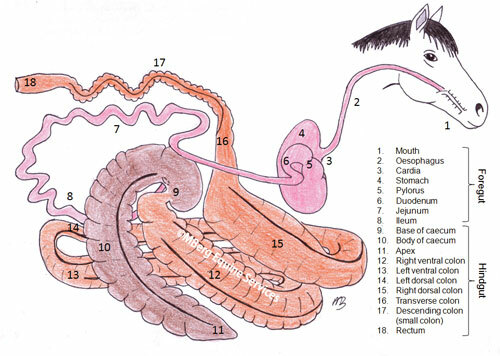 The equine digestive tract is very complex. One sign that the colon is under undue stress or malfunctioning is the development of diarrhoea, whether mild or severe. Once colon health is disrupted, its ability to carry out the normal functions of digestion and absorption are critically affected. Colitis disrupts the integrity of the mucous membrane lining of the gut. Once affected, the colon may not be able to absorb enough water and nutrients, leading to reduced healthy gut bacteria and gastrointestinal tract inflammation. Causes can include both the infectious and non-infectious. Infectious causes can include: Salmonella, Clostridium difficile infection, Clostridium perfringens infection, Potomac horse fever (Neorickettsia risticii infection), Equine coronavirus, and Strongyles infestation (a potential parasitic cause). As part of a full health overview, EquiHealth can help to rid of infections that may be causing the colitis and help to prevent the condition. If at any time blood is noticed in your horses bowel movements or when they urinate, seek urgent medical advice. This isn’t a condition in itself, but a serious symptom to look out for, which could relate to any one of a number of potential conditions or diseases. These could include parasitic infection, colitis, or bacterial infection. Professional diagnosis is necessary. Most horses will be constipated from time to time, and if your horse shows no other symptoms, it is usually harmless. Although we would still recommend a health check for your horse to ensure no underlying cause has been missed. Constipation is characterized by the back-up of solid waste in the intestines. It can be the result of not enough roughage in the diet, parasitic infection, gastric problems, stress, blockage, or as a side effect of some medications. A physical blockage of part of the inner digestive tract may be causing impaction. If this is the case, or is suspected, seek medical help immediately. Changes to look out for are the same as the signs and symptoms listed for Colic, above. EquiHealth is useful to reduce these symptoms and bring about a more relaxed wellbeing for your horse, alongside other natural lifestyle and dietary improvements. Dehydration occurs when there is an excessive loss of water in your horse’s body. The problem often results from conditions involving diarrhoea, where care hasn’t been taken to ensure the water loss from the diarrhoea has been replaced. Anaphylactic shock (shock triggered by an allergic reaction). A horse’s skin loses its elas ticity when its body fluid or electrolyte levels are depleted. 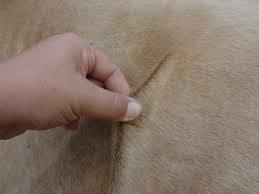 An easy way to identify this is to pinch up a skin fold along the horse’s back. A dehydrated horse’s skin will stay up in a ridge, while healthy skin should spring smoothly back into place. Use EquiHealth to stimulate the immune system and digestive function pathways correctly, locating specific flow blockages with our unique acupressure point location and treatment system, to help improve your horse’s wellbeing, and to help treat the underlying cause of the dehydration, along with ensuring more fluids. Diarrhoea itself is not a disease. It is a symptom of another underlying condition or problem. It is diagnosed when the faeces suddenly changes in consistency to runny liquid, and remains so for more than 24 hours. It can range from mildly loose stools to very watery. Mild diarrhoea may initially go unnoticed, especially if your horse is often out in pasture. More chronic cases may result in weight loss; reduction in healthy appearance, especially around the eyes and coat; and persistent lethargy. Causes can range from parasitic involvement, to poor diet, bacterial infection, inflammatory conditions, medication side effects, and ingestion of toxic substances, such as some plants. EquiHealth can help to pinpoint areas of potential cause, and treat them along with natural herbs and dietary changes. Excessive salivation may be caused by a harmless fungus, for example. The problem usually self-resolves once the substance is removed, or the horse moved away from the toxicity. Common culprits include Slaframine, which is a soap-like chemical produced by the plant fungus Rhizoctonia leguminicola, commonly found around clover. A good check that you can do yourself is to look over your horse’s face and head for any signs of nerve damage. Is one ear or eyelid drooping? Does he react by blinking when you move a finger toward his eye? Can he easily take a treat from your palm and chew it? Although check around your horse’s mouth and teeth. Can you see any foreign objects or broken teeth? Does the breath smell, perhaps indicating an infection? Is any saliva coming out of his nostrils, which may indicate an obstruction of some kind? Finally, does your horse have a fever, or appears lethargic, which may indicate an underlying illness. Use of EquiHealth has proven useful to help with the cause of many symptoms, including drooling, and helps to improve the overall health of your horse, with consistent results. Clinical signs of ulcers in horses can be very hard to spot as they can be initially very mild. It may be that your horse’s behaviour changes, or they become less enthusiastic. These subtle changes could be signs of stomach problems or the beginning of an ulcerative condition. Gastric ulcers can affect any horse at any age. Foals are particularly susceptible however, because they secrete gastric acid from an early age. In adult horses, gastric ulcers occur more frequently in more active, performance horses. Also, when any horse exercises, stomach acid may ‘splash’ to the more sensitive upper stomach area, causing what we would know as ‘heartburn’. Risk factors for developing gastric ulcers including the horse’s anatomy itself, where the stomach is much smaller compared with the stomach of many other species; physical and environmental stress, such as transportation and stalling; and the prolonged administration of some non-steroidal anti-inflammatory drugs. Help to treat Gastic Ulcers with EquiHealth, improving the function of the digestive system, and balancing acid/alkali content of the stomach. When horses don’t eat enough to meet their energy and protein requirements they can lose significant weight, and vital nutrients. There are a number of reasons why your horse’s feeding habits may have changed. It may be age-related, due to a change in living condition, separation anxiety, a change in feed, or some kind of pain or discomfort, for example from dental problems, mouth ulcers, gastric ulcers, and inflammation or abrasion of the oesophagus. Injury can also be a cause. The use of EquiHealth may help your horse to get back on track, improving condition, treating underlying causes as listed above (alongside dietary and any other changes that need to be made). Regular users have reported significant improvement in both indivdual conditions and their horse’s overall wellbeing.